Dr. Tian received his bachelor degree of Medicine (equivalent to MD in US) in Hunan College of Traditional Chinese medicine, Hunan, China. He has started his TCM practice since 1984 in the affiliated hospital of Hunan Academy of Traditional Chinese Medicine & Meteria Medica. In 1990, he received his master degree of TCM oncology in the same Academy. His thesis was about treatment of liver cancer with TCM and his findings were published in Journal of Traditional Chinese Medicine, a top journal in the field of TCM. His findings also led to a development of a novel herbal medicine, named “Gan Fu Le Pian”, for treatment of liver cancer and it was eventual approved by the Minister of Health of the People’s Republic of China. In 1995, he received his Ph.D degree in Cancer Pharmacology in Sun Yat-sen University of Medical Sciences in Guangzhou, China. From 1997 to 2005, he worked as research associate in Howard Hughes Medical Institute in School of Medicine University of Pennsylvania and Lombardi Cancer Center at Georgetown University Medical Center. His research was focused on identifying molecular target of cancer to sensitize cancer cells to conventional radiotherapy and chemotherapy. His works were published in several articles in peer-reviewed scientific journals including Cancer Research, Neoplasia, Oncogene, and International Journal of Oncology. From 2003, he started to practice in Rockville of Maryland as an acupuncturist. Most of his patients are cancer and leukemia patients. 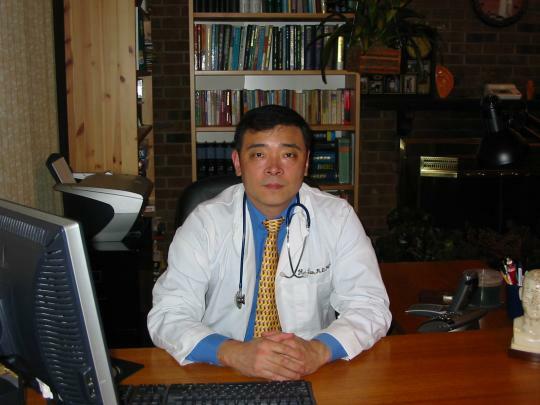 In 2006, he was invited as a co-chair of a meeting of Traditional Chinese Medicine and Cancer Research sponsored by Office of Cancer Complementary and Alternative Medicine in National Cancer Institute in Bethesda. In 2006, he was elected as the Executive Council Member of Specialty Committee of Oncology of World Federation of Chinese Medicine Society.